If you are looking for a short golfing break in Scotland then we have plenty of ideas for you. Just a small selection of the possible packages are outlined below. We would be delighted to provide you with a personal quotation for your golf break. Browse our choice of golf courses, or select a region of Scotland from the map on the right, and then tell us where you would like to play through our custom enquiry form. It's never too early to plan your next golf trip. Why not enquire about one of our tour packages and enjoy a taste of links golf at the home of golf! Perthshire, in the heart of Scotland, offers scenic inland golf and is just over an hour’s drive from both Glasgow International and Edinburgh airports. Find out more about the golf courses from which you can choose in this area. Edinburgh airport has an increasing choice of inward flights. Choose from a superb range of coastal links and inland courses within an hour of the airport. Enjoy a historic golf setting in St Andrews which is as accessible from Aberdeen airport as it is from Edinburgh airport. We have a great choice of coastal golf courses around St Andrews. These are great options for golfers flying into Glasgow Prestwick airport with airlines such as Ryanair. Take a look at our full selection of west coast courses. 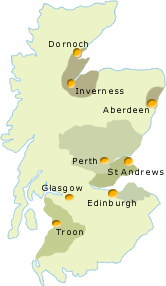 There are many more golf courses we recommend considering for a golf trip to Scotland. We are happy to customise our packages to your requirements. You can select your length of stay, the courses you wish to play and the level of accommodation that you prefer. Go to our enquiry section to request further information on one of our golfing breaks, or we will be happy to provide a quote for a customised Scottish golf tour through our custom tours enquiry form.